A. M. Russell's five-year plan calls for tunneling 150 feet further into the granite walls of Panamint Mountains—and there he has faith he will find his gold mine. But it takes a lot of faith. 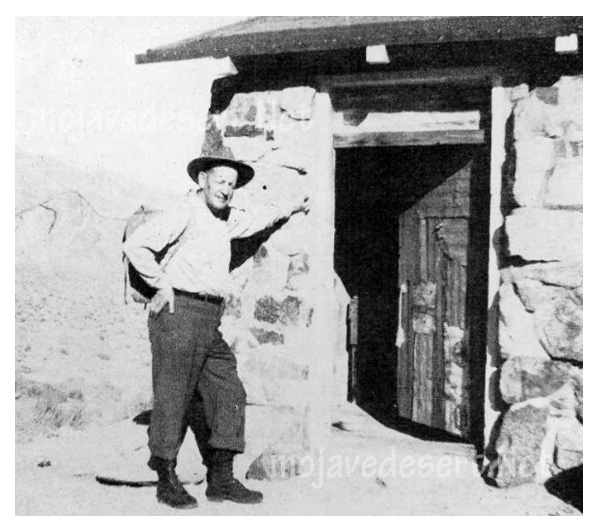 My cabins are the base of 7200-foot Manly Peak in the Panamint Mountains, Death Valley, California. I started building them in 1930, the same year I found the gold high up the side of old Manly and began my mining operation, now a long horizontal shaft into the side of the mountain. From my favorite chair in front of the cabins I have a 90-mile view across the valley. My locust trees are the only ones within 125 miles, as far as I know. Just looking at the way they defy wind, storm, rain and snow gives me inspiration. Their bark is unscarred, well-balanced, leaves emerald green, but how they survive I'll never know. The concord grapes are doing well, too. Twenty-five years ago coming through Riverside, California, I stopped at a nursery and bought a half dozen bare-root size, wrapped them in a newspaper, laid them on the running board with a wet gunny sack and today they are 20 feet of beauty. I had hardly finished cleaning out my spring, a yearly chore, and settled back in my spring steel patio chair (some tenderfoot brought it out five years ago and forgot to take it back) when the black pickup truck with the white lettering drove up to pay respects on a routine inspection. It was tall kindly-faced Matt Ryan, the National Monument ranger, and his wife. I'd always missed him before. It was the first time we had met. His headquarters is at the other end of the monument and I am only here two weeks every year for my assessment work. We had a chat about the baby burro stealers, the bad sports who kill game and leave it by the springs to stink, the roving high graders, the city fools who lose their heads and wander from their car as soon as they are lost, about many things. He thought I had a very nice camp and mill-site and asked how the mine was coming along? Was I working alone? He knew the answers, it's the same as last year and the years before that. The miners were enticed into the airplane factories. With a pair of pliers and a screwdriver they had a cost-plus paradise, and still don't realize it's over. Just sit around waiting for the call that doesn't come, instead of going back to the hills. The sun was already behind Manly, so after a cool drink of that natural granite filtered water, Matt had to shove off. In parting he remarked: "Russ as long as you show Good Faith, that's the main requirement." After the black pickup crossed Butte Valley it looked like a speck and disappeared from view. I relaxed and wondered how much Good Faith one man is supposed to have. That ranger didn't know that 1 had plenty of Good Faith long before they decided to make this a national monument—had to. And I have never lost that Faith even though there have been a few setbacks. I am now 60, so if 1 finish my mine tunnel in the next five years, we'll retire together, my Faith and me. It's been ten days now, since I have seen anyone, a fellow was supposed to drop the mail and some supplies off four days ago. He may have had trouble, because at that time we had a twister. The wind blew down the canyon so hard it raised the roof off the shack. Pulled the nails out three inches. I got some heavy wire and wired it to the floor. Just finished when the wind changed, came back up the canyon, started raising the other side of the roof, cracking rafters. I cut the clothesline and wired that side down just in time. Was undecided whether to move to a nearby cave in the rocks or stick it out. I stuck it out. In the morning the wind died down. I spent the morning picking up and bringing back to camp everything that was loose and moveable. I wondered if the elements were trying to run me off, or just annoy me. Next day the wind blew again so hard it was impossible hardly to go outside. Three more lost days with nothing accomplished. I needed Good Faith. Last year the burro, "Jubilee" we called him, was shot or stolen. I had raised him from a colt and just got him to where he could pack and be of some help. Now my back has to take his place. The year before that I was caught in a cloudburst about 9 p.m. on the side of a mountain. Had to drive by instinct: water all over the road, rocks bouncing over the top of the car, both front tires flattened, roads washed out. I was two days trying to get to town. It took Good Faith. The year before that—all alone as usual—I was trying to pry out a boulder in the path the wheelbarrow must use and double-ruptured myself. That meant the hospital and recovery. No matter how good a desert driver you are, things will happen on these dirt roads. A sharp rock sticking up out of the sand, took the plug off the crankcase and then knocked the plug out of the gas tank. The new broom I had along made some plugs until I could get some new ones, but I lost my gas and oil, and before reaching camp the car buried itself up to the hub caps in the soft sand and silt. 1 had to cut sagebrush and lay it for a road to get clear. Another year, if I recollect right, the tunnel was in about 150 feet deep —too far for a wheelbarrow. I needed an ore car, ties and rails. Had a fellow helping me that year. He forgot to shake his trousers in the morning (a desert must!) and a scorpion bit him before he had his suspenders adjusted. So he quit and I was along again with my Good Faith. The fellow who was doing the packing by contract to get my stuff up to the tunnel had five burros. He always slept on the ground by the spring. Chewed strong Black-jack plug tobacco. He was about asleep one night when a snake crawled over his face between his upper lip and nose. He's not sure what kind it was but he swallowed his tobacco and got so upset he couldn't sleep or eat, so he pulled out for a couple of weeks. These delays are costly but we must have Good Faith. Well, I tried to hire a couple of fellows to help me. Had no luck. A mine owner at Tecopa said, "Russ, there just isn't any extra help around. But to help you out, you take two of my muckers for a week or so." I had to guarantee them two weeks' work, board and room. My tunnel is one mile up the side of Manly Peak, a winding burro trail the only way up. These two fellows couldn't even climb up that trail with the water, powder, drills and lunch. So I had to keep my agreement and give them two weeks' work around camp. Another two weeks lost! Pack rats run all over my cabins. Some of them have been stealing cotton from the bottom of the mattress I am sleeping on and I couldn't figure out where they were taking it. All I knew was they sure made a lot of noise getting it through the springs. I just bought six new traps and went out to the car to get them. As I raised the rear compartment door, there was my cotton. The packrats were building a new nest among my extra powder, fuses and caps. All they have to do now is finish their nest with matches, set one off, burn up my transportation and I will have a 65-mile hike back to town—and my Good Faith will be shattered for this year. But out here, there's always a blue sky, good pure water filtered by Nature through lime and granite rocks, smogless air, no 50-cent parking lots, fresh sage and pinyon pine. I shouldn't ask anyone for help, because it's my problem. But I have Faith, and it will pay off! I started the tunnel five years ago. I was married and had a son. My wife said one year, "I am going to break you of that desert habit of yours. Every year you go to Butte Valley and stay too long. I warn you, if you stay over two weeks this year I will divorce you!" I had good intentions of returning in two weeks but circumstances were against me. Some fellow and his family had been working some tailings on an old dump and were just ready to pull out. Their grub was all gone. He warmed up the motor of his truck, but forgot he had drained the radiator the night before. When that cold spring water hit the hot motor it cracked the head. They were stuck and I had the only car within 65 miles. I agreed to see them through. Gave them my grub and started for Trona, via Ballarat. At noon a cloudburst hit the Slate Range and all roads were washed out. It was several days before I could get over the roads. Then there was no motor head at Trona. Had to send to Los Angeles. So by the time I returned to camp, helped install the head and did some necessary work, it was three weeks before I arrived home in Los Angeles. My wife was gone and had taken my son. I was divorced. My boy, now 24, has never seen the tunnel his Dad has been working on for so long. The day I found that high grade ore among the boulders and decided to drop down the hill a thousand feet and drill that tunnel, I had to have a lot of Good Faith. The tunnel is now 330 feet in solid rock, all driven by hand. I still have 150 feet to go, but I figure I can finish it in another five years, if I have Good Faith!